Susan Evans, who serves as Director of the Smithsonian Food History Programs and was previously Marketing Manager of Magic Hat Brewing Company in Vermont, will provide a keynote speech at the 2017 Beer Bloggers & Writers Conference. We are very excited about this in part because Susan comes to the conference both from a traditional path (a brewery) and a non-traditional path (as someone involved with a beer history project at our national museum). We caught up with Susan to ask her a few questions. You are the Director, Smithsonian Food History Programs, at the National Museum of American History. How did you get such a cool job and what does it entail? My experiences working both in museums and in craft brewing have come together in this amazing role, where I get to work with our curators, researcher, scholars, and educators to use stories of food to connect audiences with American history. Food and drinks are a great way to make personal connections to broader stories of history. One example is our chocolate demonstration program where we take audiences through the process of making drinking chocolate in the Colonial era and then make connections to late 18th century global trade routes. Starting with chocolate makes it a lot easier to find a personal connection to historic stories of global trade routes! We found you, of course, because the National Museum of American History posted a job opportunity for the role of Historian / Scholar of the American Brewing History Initiative. Why was this role created and what will this person do? We are thrilled to launch the American Brewing History Initiative! Brewing and beer have been an important part of the American experience since before the nation’s founding and continue to shape industry and community life to present day. The Smithsonian’s National Museum of American History is uniquely positioned to document the stories of American brewers and collect the material culture of the industry and brewing communities for the benefit of scholars, researchers, and the public. 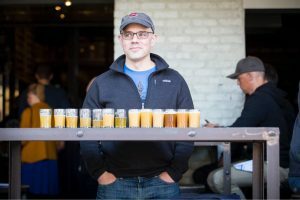 The new historian on the project will explore how beer and brewing connect to larger themes in American history, from agriculture to business, from culture to economics. The person will conduct research, both archival and oral histories, and document that as part of the Smithsonian’s collections. An important part of the role will be sharing that research with the public, through programs, presentations, and on social media too….so look out for more on beer history from the National Museum of American History in 2017. The American Brewing History Initiative is already up and running, including a collection of historic documents and objects and programming related to the beer industry. How has the project and the events been received by the public? People love learning about beer…and we’ve had a great response to this project so far. Our programs on brewing history have brought together pioneers in the craft brewing industry together with historians to talk about the impact of brewing on American history. And, no one turns down the opportunity to learn about history by tasting it through beer! You yourself spent three years as Marketing Manager of Magic Hat Brewing Company in Vermont. Obviously that experience gave you a leg up on your current job. But do you miss working directly in the craft beer industry? I had an incredible experience working at Magic Hat Brewing Company, and I continue to build on those experiences in my current role at the Smithsonian. In my time in the world of beer, I found that the craft brewing industry and community are a tremendously friendly, warm, and welcoming group. Collaboration is one of the core values of the industry, which makes it a great group to work with. Luckily, in my role at the Smithsonian, we have the opportunity through the American Brewing History Initiative to bring brewers into the museum and continue to work together. As keynote of the Beer Bloggers & Writers Conference, have you thought at all yet about what topics you might address or messages you might impart to the audience? I think breweries and museums have a lot to learn from each other about building relationships with their audiences. Beer bloggers and writers have been incredibly influential in creating a craft beer community. I’m looking forward to talking about my own experiences in both industries, sharing more about what we’re working on for the American Brewing History Initiative, and hearing from conference attendees about their work and where they think the brewing industry is headed. 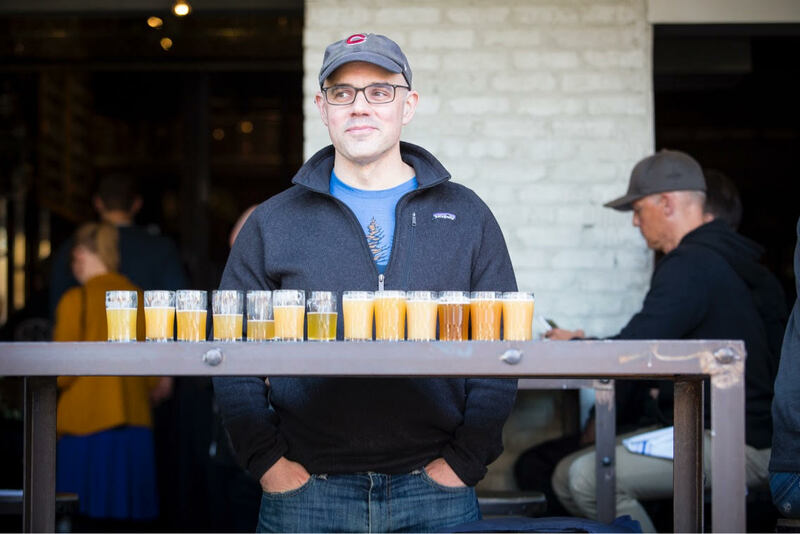 Stan Hieronymus, long-time beer writer and blogger at Appellation Beer, will deliver the keynote address at the 2016 Beer Bloggers & Writers Conference, scheduled for July 8-10 in Tampa, Florida. Stan started his writing career with the Champaign-Urbana News-Gazette but ultimately left behind a steady paycheck to write on his own account. He writes for a number of beer-related publications as well as about beer in non-beer periodicals. He is the author or co-author of seven books and his next book, Brewing Local, will be out in September. See below for a Q&A with Stan and please remember to register for the BBC today if you have not done so yet! You have a long history of writing, including at newspapers and for the last 24 years as an independent writer. You seem to have been well ahead of the curve by leaving newspapers for your own independent status. Any regrets about not having an actual title and employer? Stan: It is not like Daria, my wife, and I sensed what was going to happen to newspapers. We simply had more that we wanted to do, and it was worth paying our own health insurance to do it. One of the things I miss about working for a newspaper, particularly on the copy desk, is no longer part of the business. At 1 o’clock in the morning we were sending the news to the presses. Five hours or so later people were picking up their paper and reading that news. It’s a rush. Newspapers don’t work that way any more. I also miss the interaction with fellow workers. Even the jerks. You have been writing about beer since 1993. What made you switch from writing about many to subjects to, now, primarily about beer? When I was 23 the managing editor at The News-Gazette in Champaign, Illinois, lured me away from sports to become the city editor by convincing me “It’s different every day.” Beer is as diverse, and I don’t have to screw with sewer board meetings. There’s the history, the culture, the people who drink it, the people who make it, the business, the technical aspects, agriculture, and the beer itself. In your career, you went from newspaper staff writer and editor to blogger at Appellation Beer. Many of our conference attendees are considering or dreaming about the reverse, going from blogger to paid writer at a magazine or newspaper. Do you have any advice for them? Career paths are strange. I’ve had a lot of friends go from newspapers to PR or something on corporate communications. That was usually a matter of money. I’ve had others who went to work for politicians. That’s usually been an adrenalin thing. If this is a career it is an accidental one. We, Daria and I, have seen things we wanted to do and figured out a way to pay the bills along the way. She got a second masters and now works at the National Archives. I feel a lot less respectable still writing about beer. The blog was sort of an afterthought. I simply knew there were things I wanted to say that weren’t going to be parts of stories I would/could sell. Maybe it helps sell books – I don’t have a way to measure that. But I learn things that make whatever I might be writing better. And it lands me in the middle of a community I would not be a part of were I simply scattering comments here and there. I can’t underestimate the importance of connections I might not know exist. You start to explain something to somebody in Poland and they tell you they’ve read it in your blog. That allows us to have a meaningful conversation. I still haven’t answered your question, have I? Maybe that’s what I will be talking about in July. A short answer would be that if the blog is supposed to be an audition for a job figure out what the job you are auditioning for is. In some industries there is a great divide between “bloggers” and “writers”. In others, such as in the beer industry, that differentiation seems rather unimportant. What do you think? Maybe it is related to the fact that what is called craft beer and digital media reached the tipping point at the same time. You mention on your blog your goal of writing about beers from a place. In the wine industry, from a place (terroir) actually means to many people that the local altitude, climate, terrain, and soil condition affects how grapes and thus wine taste. What does beer from a place mean to you? Beer is just as much an agricultural product as wine, but it has two key aroma/flavor agents (malt and hops) where wine has one (grapes). Winemakers make a choice about showcasing terroir and brewers may as well. But there is the human element as well: the place we drink the beer, the relationships we have with the people who make the beer, where the beer fits in our community. Not every beer is going to reflect the place where it is brewed – at least to me – but I have a special appreciation for those that do. You have a pretty amazing schedule on your blog, hoping to post three times per week including a collection of links to other blogs. That has got to take a lot of time and effort. How do you do it while also writing enough for pay? I don’t. My output the past six months has been pretty meager while I was hunkered down working on “Brew Local” and keeping up with stories I was committed to. I’d say to make it work you start with coming up with an answer for the third question. One thing I won’t forgo is reading what else is being written about beer. I always learn something. That makes the weekly links easy. Do you have any idea yet what you might speak to our attendees about at the 2016 Beer Bloggers & Writers Conference? I’m pretty sure it will be related to beer and writing. Probably about balance, texture, and nuance in both. And maybe a bit about the Oxford comma. In Craft Beer, Ken Grossman is legend. His passion is evident, and his story both inspires and teaches. It may be safe to say that Ken Grossman is also an icon of American business and entrepreneurship. One look at the Sierra Nevada Brewing Co. historical timeline and one becomes acutely aware that the brand’s success is a direct result of this one man’s tenacity, courage, and commitment to quality. So then it should be no surprise that we here at the Beer Bloggers Conference are tickled pink to announce that Ken will be keynoting the BBC this summer in San Diego. Whoo hoo! Sierra Nevada has been a big supporter of the Beer Bloggers Conference – both from a sponsorship standpoint and as a participant at the conferences; it’s clear that Ken Grossman and his team value the role that bloggers play in Craft Beer. Bloggers even play a cameo role in their Our Story video! We look forward to having Ken join our community in person when we gather in San Diego in August, and we appreciate him taking the time to talk with us. Sounds like he’s excited too! In prep for this post, we thought it would be fun to read what some of you have already written about Sierra Nevada and Ken Grossman. A collection of some of the ones we found is below. If you have a post about Sierra Nevada and/or Ken Grossman in your blog archives, please share the url to your post in the comments below, and help us welcome Ken to the Beer Bloggers Conference! The 2014 Beer Bloggers Conference will take place in San Diego, CA where upwards of 150 beer bloggers and industry representatives will assemble to discuss all things beer, blogging, and social media. 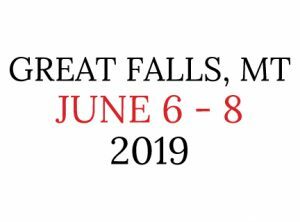 Registration is open for the conference, and early bird pricing begins at just $95.00 for citizen bloggers (expires March 31) Please check out our America page for complete conference details.